The leader of the council says the works are part of the IWC’s “continuing aim to get a good and reliable service for residents during this extended trial period”. 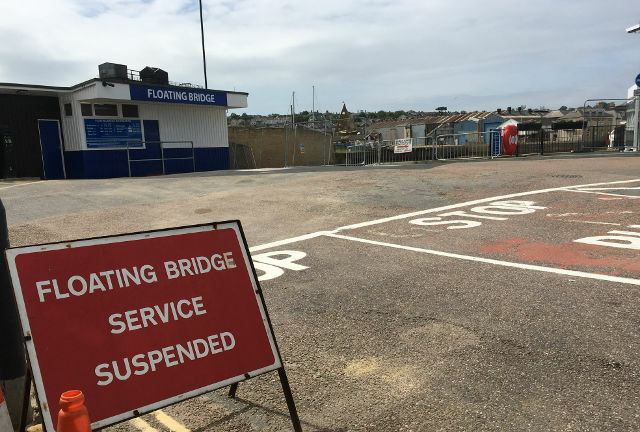 The floating bridge will be out of service this Thursday (19 April) for on-going maintenance work to improve electrical and navigation systems. Noise-damping material will also be fixed to the bridge’s prow to further reduce noise. The foot passengers launch will be in place while the bridge is out of service. fit damper material (Trellex) to further protect the chain ferry prow. An independent noise consultant will, with Environmental Health, be taking further noise measurements on site at the council’s request – this will follow the above works to the underside of the prow ramps to reduce noise. “This planned works is part of our continuing aim to get a good and reliable service for residents during this extended trial period. 5 Comments on "Floating bridge suspended later this week for improvement works"
“Continuing aim to ……………….” It’s broken down again. It’s broken, a broken design, a broken service, and a broken promise to LEP and the communities of Cowes & E Cowes. ££ million of public money wasted on a bad design, a poor execution and a broken result, £900, 000 of Islanders taxes spent patching up a broken service. It’s a disgrace. Popularised by Mark Twain over 100 years ago. ‘There are lies, damned lies and statistics.’ Now, about these statistics…!